This is a deliciously aromatic noodle soup which is full of fresh flavours and really quick and easy to whip up. Add the vegetable oil, curry paste, and garlic to a heated wok and fry until aromatic. Pour the coconut milk into the work and bring to a simmer over medium heat. Add the vegetable stock and continue to simmer. Add the fish sauce, sugar, lime leaves and beans. Meanwhile, cook the noodles in a medium saucepan of boiling water for 3 minutes or until tender. Drain and divide among serving bowls. Add the fish to the wok and cook for a further 1 minute or until fish is just cooked through. Stir in the chilli and the spring onions and remove from the heat. Squeeze the juice of the lime into the wok, add the coriander and the mint. Ladle the hot soup into the bowls of noodles. 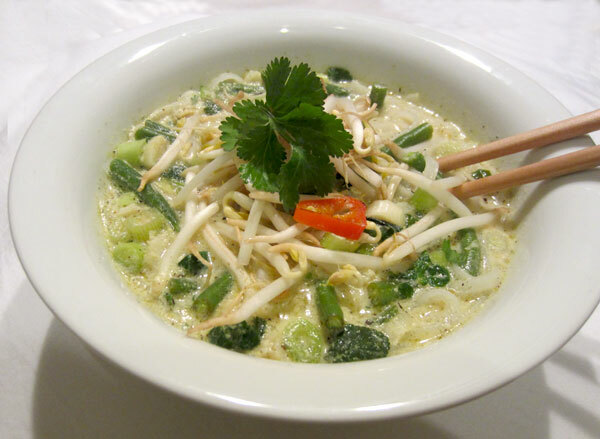 Divide bean sprouts among serving bowls. Garnish with coriander.